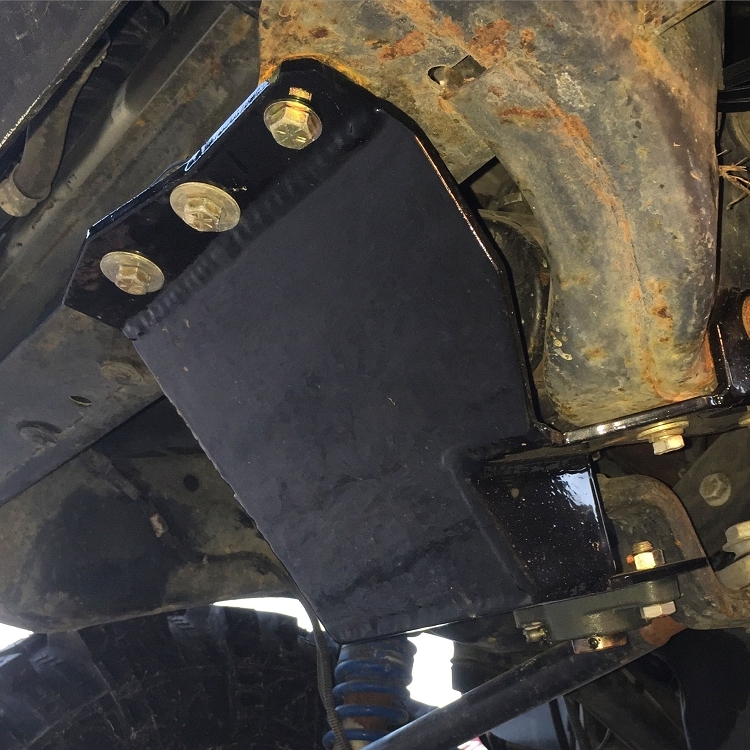 The most effective and unique steering brace ever made for Dodge Ram trucks, the Dodge Off Road Steering Brace is our patented answer to the problems associated with Dodge steering boxes. The steering is setup is a push-pull system, where the steering box takes a horizontal load on the sector shaft that it was never designed to handle. This causes the steering boxes to wear out quickly and eventually start leaking fluid as the seals break down. The result is poor steering control, wandering, and sometimes death wobble. Our steering brace supports the sector shaft and prevents it from moving side to side by using a large 2 bolt flange bearing that is greaseable and replaceable. Other steering braces tie both frame rails in together, which allows the frame flex that is prevalent on Ram trucks to twist on the sector shaft as the brace itself is twisted. Ours is the only brace that does not allow frame flex to exert any force onto the steering box, thanks to it's unique one-sided design. We also use better materials than most brace manufacturers - all 1/4" construction, 1/4" wall tubing, a high quality bearing, and all Grade 8 hardware. The brace is powder coated gloss black and comes with detailed instructions for installation, which usually takes 10 to 15 minutes. 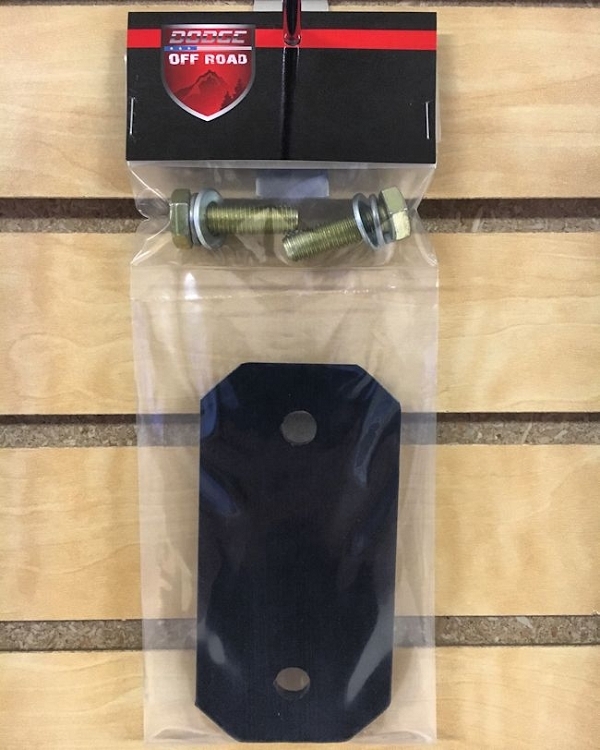 You will notice that your truck has tighter steering, drives straight down the road better than before, and you can also protect the steering box itself from future failures and impacts, since our brace is also designed as a skid plate. You simply cannot get this kind of quality and value from anybody else in the world. How did we come up with this unique design? The answer is simple - we are Ram owners who were tired of sloppy steering. Other steering braces seem to fix the problem temporarily, but we found that they were actually wearing out our expensive steering boxes over time. We started to cut apart a normal brace and then added gussets, but it wasn't enough. Then he tied it in to the crossmember, created a skid plate in the process, and now we have the patent on single-sided Dodge Ram steering braces. This is the only brace that works as described, without damaging your steering box! You can only get this kind of ingenuity from someone who really knows Ram trucks, because we drive them. Call some other brace manufacturers and ask them what their daily driver is - 9 times out of 10, they are selling you something that they don't even use themselves. All braces are test-fit on a 2nd gen frame before being sent out, to ensure that they fit every single time. We also have a full time welder who does nothing but steering braces, which is another way of making sure that the quality is consistent. These are backed with our lifetime warranty - break it, bend it, or otherwise damage the brace and we'll send you a new one. 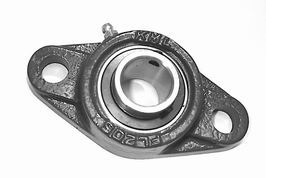 The bearing itself is a replaceable piece that typically lasts 3 to 5 years, sometimes longer if you keep them greased. We sell replacements for about $15 if you ever need a new one. The brace is made entirely out of 1/4" steel, and our sector shaft extension is machined from 303 stainless steel. All other brands use a cheaper 1018 steel that is zinc-coated, but they still rust in a few months. All hardware needed is included and is Grade 8 (SAE) or Class 10.9 (Metric). You will reuse your existing steering box bolt. The DOR brace fits all 2nd gen steering boxes, except for the new PSC SG-850 box. See part number 1001-PSC for the correct brace for that steering box. My 2001 Cummins tows heavy and was "all over the road"! New ball joints helped, but then I installed the DOR steering brace and WOW! Night and day! Much tighter steering gives a lot more confidence when towing big trailers down the highway! Install was straight forward. Highly recommend! Have this on BOTH of my 2nd Gens! 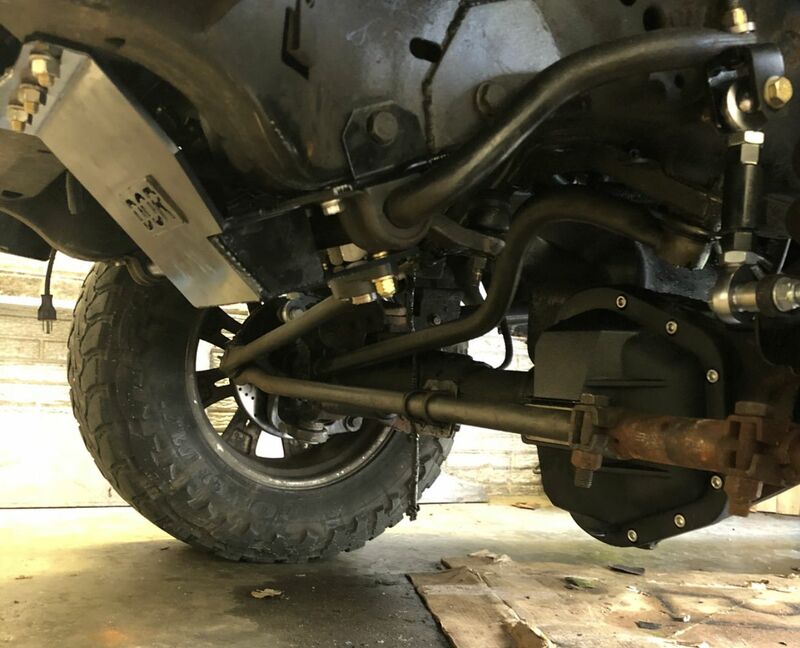 I saw a noticeable improvement when I upgraded from a traditional style steering brace to the DOR unit on my offroad rig. Frame flex no longer damages the sector shaft and I can easily steer my 37" MTRs while articulating, without hydro-assist. I ended up purchasing another unit for my V10 tow rig 2nd gen to compliment the Borgeson box and shaft....steering is like butter! So I've been improving my steering for quite so time replaced just about everything. I saw the normal steering box stabilizer that puts tension on the sector shaft when offroading. I thought someone will buil this better and the real reason I am writing this is because it took almost all the play out of my worn steering box so highway driving is much more comfortable. If you are thinking of buying this then you also want to improve your ride. It only took 20 min to install with basic tools so buy it and quite your whining about dodge steering. I thank Danny and dodge off road for a D*** fine product! BAM!! I put this on my 215,000 mile truck with the original steering box and it not only tightened up the steering while driving it made it easier to steer when stopped, even with 37" MTRs on pavement. A: The Borgeson box is a unique box, so unless you have ordered a Borgeson box, it probably has the Saginaw style. All factory replacement boxes, parts store boxes, re-manufactured boxes, and the Red Head steering box are all Saginaw versions. The easiest way to tell the difference between the two is to look at the steering box input, where the steering shaft connects. If there is an adapter there, it's the Borgeson box. If the shaft bolts directly to the input on the box, it's the Saginaw version. Q: Can this be use with 2 wheel drive? A: No, sorry. They use the same box and frame, but the suspension parts around them are different and will interfere with the brace. Q: If I order one for a Borgeson box can I later use it with a redhead box if my borgeson ever fails? A: Yes, the 2nd gen brace fits all 2nd gen steering boxes currently on the market. 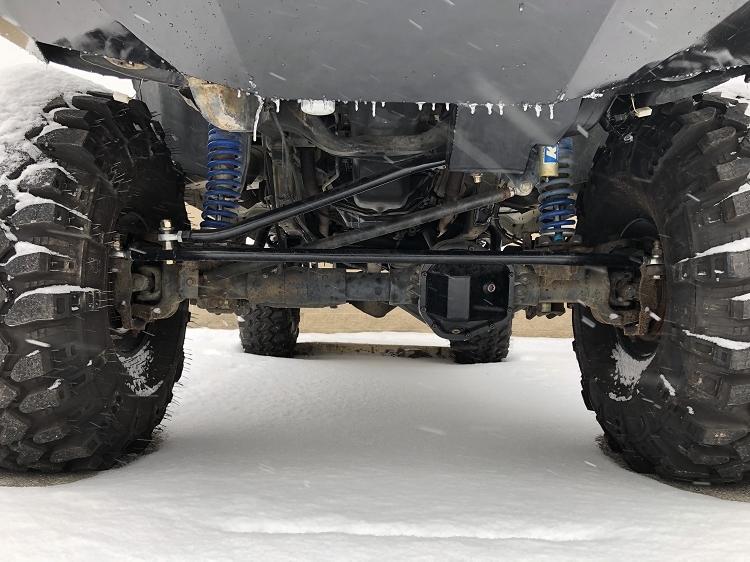 A: The brace will fit with the Off Road tow hooks by using longer bolts (we will supply them, just put in the order comments that you have an Off Road package truck), but then adding sway bar drop brackets on top of all of that is kind of asking for trouble. It will work, but the amount of force on those sway bar bolts will be pretty serious. The best thing to do is get rid of the drop brackets and run extended sway bar end links like the ones we sell. Then the sway bar will be mounted below the tow hook bracket, without all the extra leverage on those small bolt heads. Q: I have a 2001 2500 cummins with a fisher minute mount 2 plow. Will this work with the frame horns for the plow that also bolt to the factory sway bar bushing mounts? A: Our brace works with some plow mounts, however I'm not sure if it works with all of them. We have not test-fit the brace with that particular setup so I would just need to see it to know for sure. If it mounts to the sway bar bushing holes, I think you might have some clearance issues using both together, depending on how wide the footprint is for the plow mount. If you can email a picture of your driver side plow mount, we can verify if it fits or hits. A: Yes, you'll need to remove the lower front factory steering box bolt, and then reuse it to install the brace. If your box is factory installed, it's the Saginaw version. We don't make the brace with tapped holes. What you will need to do is get a 7/16" tap and corresponding drill bit (size depends on the tap manufacturer) and then drill and tap that hole, and use a larger bolt. We have had to do this on older trucks and it works great. It's very easy to do and only takes a few minutes. You can also drill the hole out to a larger size and use a Heli-coil, if they make one with a 10mm thread. Either of those options will give you some new threads in the frame. A: The 2nd gen brace fits all 2nd gen gear boxes, and bolts right up to your truck without drilling. When these are in stock, the product page will indicate that. Otherwise it will have a build time listed. Inventory varies day to day so it's best to just check the product page, which is updated in real time. 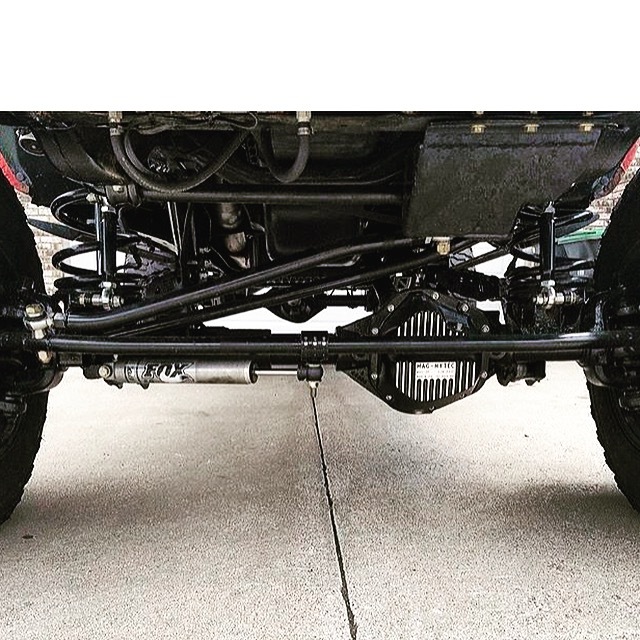 Q: I have a 95 2500 lifted 5" and was wondering if the brace would clear with 2" sway bar drop brackets? From the pictures it seems like it might. I just installed a borgeson pump, shaft, and box and feel like this would be the icing on the cake. A: It probably will work, but we don't recommend sway bar drop brackets. They use the same bolts that are used to attach part of our brace, and it's only a 10mm bolt. Applying that much leverage to a bolt that small is going to result in the head being sheared off. I would ditch the drop brackets and run some longer end links. It's a cleaner setup and much stronger. Q: Will this brace work a front mount hitch receiver, and if so which one(s)? A: It will work with some, but we don't have a list of which ones fit and which ones don't. 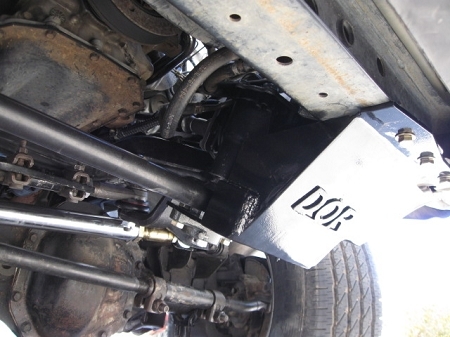 Basically if the receiver hitch mounts to the sway bar bolt holes or the crossmember under the radiator, there may be some clearance issues. Email us a picture of your setup and we can verify if the brace will work or not.